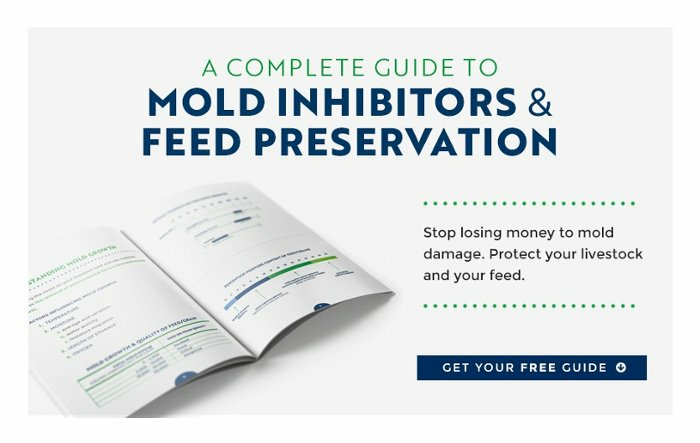 More than 300 types of mycotoxins are produced by molds, which means that there’s a good possibility your operation has encountered problems because of mold damage and mycotoxin production. Finding ways to protect livestock health, maintain profitable levels of production, and eliminate expensive veterinary costs is critical to running a successful operation. Whether you want to lengthen the shelf life of feed or are focused on providing a nutritionally complete diet to your animals, mycotoxin binders work to enhance the quality of feed and raw materials while protecting livestock from dangerous health risks. High-quality binders latch on to mycotoxins, preventing them from being absorbed by your livestock’s gut and entering the bloodstream. Using mycotoxin binders is a great way to combat the loss of nutritive value in feeds that have been contaminated by toxins and have decreased in palatability. If you suspect that molds have contaminated your feed or raw materials, it’s essential that you immediately begin using binders. This will limit the possibility of disease due to absorption of toxins into the bloodstream. Mycotoxins can infect and harm a variety of livestock species, so it’s important to know what to look for. The effects of mycotoxins on the health and productivity of poultry depends on the type of mycotoxins produced as well as the level of contamination. Mycotoxin poisoning can cause weight loss, decreased feed efficiency, and lower egg production. Mycotoxin binders used in poultry feed provide an exceptional level of health security and a more efficient way for birds to utilize maximum levels of nutrients that can improve production rates. The increase in mineral or salt consumption usually occurs when mycotoxins impact the ability of cattle to properly absorb nutrients. Using toxin binders for dairy cattle limits mycotoxin occurrence and reduces toxicity. Supplement your horses’ diet with mycotoxin binders and bolster your efforts with healthy feed storage practices, such as maintaining low levels of humidity and proper ventilation. Following these steps can prevent serious equine health problems from occurring. Routine use of mycotoxin binders will reduce toxin levels to a degree that will not impact livestock health or production rates. Common, expensive problems—like lameness, inflammation, and infertility—can all be a result of mycotoxin poisoning. Mycotoxins represent a massive economic loss for farmers and livestock operators each year. They force costs to skyrocket and require extensive labor to eliminate and control. Adding mycotoxin binders to feed not only improves livestock health and production levels, it also boosts profitability by eliminating costly veterinary services and other expenses associated with restoring livestock health.